Adding a kitten (or 2 kittens) to your family is one of the most rewarding experiences. Two kittens can keep one another company, play together, and can share a long life together as best friends. The first year is full of milestones for your kitty, from learning how to play and interact with your family, to growing strong and healthy. It is important to learn to recognize and anticipate your kitten’s natural behaviors while being proactive in your cat’s health care plan. Kickstart your kitten’s lifetime of wellness with proper vaccines, parasite prevention, and safe socialization so you can enjoy many happy years to come. 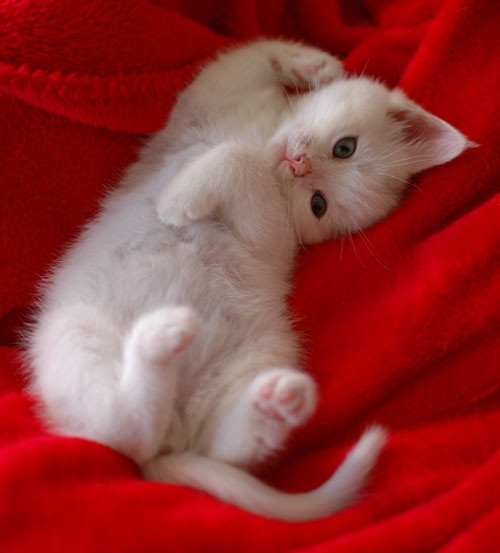 Ideally, kittens are with their mother and littermates for the first 8-10 weeks of their life. This period of time is called the socialization period. Kittens learn appropriate cat behavior and their experiences in this window of time help to shape life-long interactions with their environment. At 8-10 weeks old, a kitten is ready to step out into the world and explore! No longer dependent on her mother and littermates for life lessons and entertainment, kittens show independence and an abundance of curiosity. For many cat caregivers, this will be the strongest bonding time you share with your pet. Cat carrier, ideally with a front and top loading feature. Clean, low profile litter box with at least two inches of litter (scoopable, unscented litter is preferred). Separate food and water bowls. Kitten food, dry and canned. A crucial step in preparing for your kitten to come home is to find a veterinarian you trust. We recommend you consider using a designated Cat Friendly Practice®. These veterinary practices have taken specific extra steps to make their practice more comfortable and welcoming for cats and their caregivers. Most kittens are full of energy and excitement. Don’t let their energy distract you from keeping them healthy. Your kitten needs a thorough physical exam and protection from preventable diseases by receiving appropriate vaccines. Ideally, the first visit to the veterinarian should happen within the first week you bring your kitten home. If you have other cats in your household, your new kitten should be tested by your veterinarian before coming into your home. 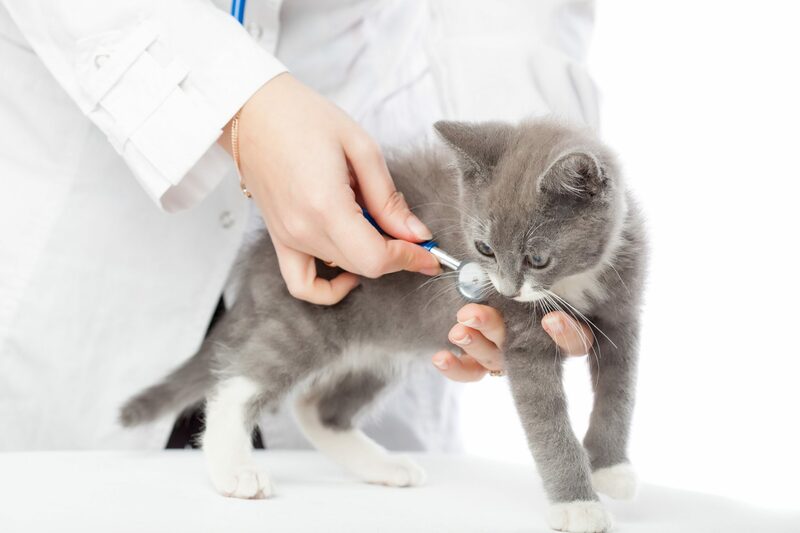 To keep a kitten healthy, vaccines are given as a series at specific intervals beginning around 7-8 weeks old until they have developed sufficient immunity, typically around 16 weeks old. During this time your kitten will become protected against the “core” group of diseases, panleukopenia (feline distemper), calicivirus, rhinotracheitis, and rabies. A less obvious point of wellness care is parasite prevention. Unfortunately, many parasites go undetected since young kittens can be infected without showing any clinical signs. To make sure your kitten does not have intestinal parasites, be sure to bring a stool sample to your first veterinary checkup. Your veterinarian will probably also de-worm your kitten at each visit since kittens don’t always shed parasite eggs in their stool. 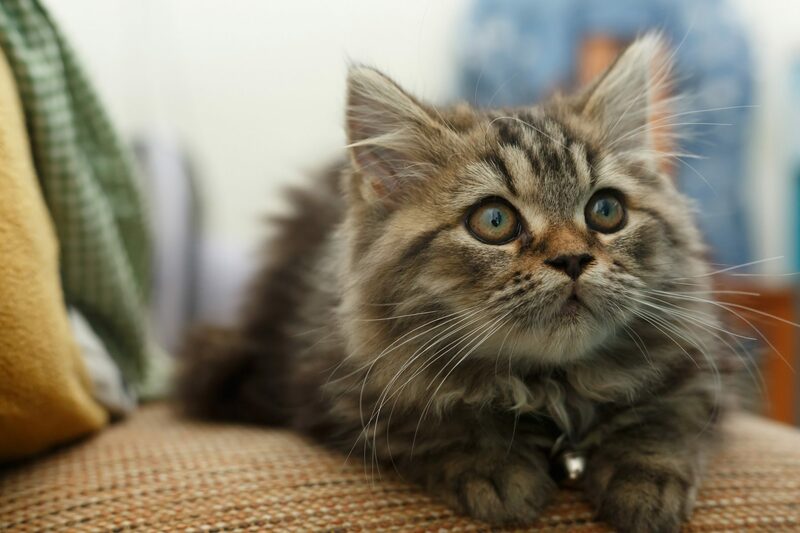 As your kitten grows older, your veterinarian will likely discuss spaying or neutering. This common surgery can be done as early as 7 weeks old, but typically cats are spayed and neutered a little older. Cats that are adopted from a shelter are usually spayed or neutered before going to their new homes. When you bring your little one home, she will want to explore! Take time to show your kitten the litter box, feeding area, and carrier. Training your kitten to be comfortable inside the carrier is an easy way to make her feel safe and secure when going to and from the veterinarian. It will also create a positive relationship with the carrier so you don’t struggle getting her into the carrier. Leave the carrier open in your living area to encourage your kitten go in and out freely. Feed your kitten treats and put toys inside the carrier so she has positive associations with the carrier. Take your kitten for short car trips in the carrier so she isn’t fearful of a car ride. Hide treats in the carrier to add to the positive experience. For energetic kittens, mental activity is just as important as physical well-being. Cats are stimulated by a variety of scents, sounds, and tactile experiences. In felines, healthy development includes acting upon their natural predatory behaviors. Young kittens will naturally stalk, pounce, and roll around with toys unprovoked – a part of her inner big cat! It comes as no surprise that a natural favorite for kittens is a furry toy mouse. Avoid stringy or yarn type toys as curious kittens may try to eat their toys instead of play. To discourage biting or scratching, make sure that you avoid using hands and fingers as ways to engage play. Feather pole toys are excellent for playing with your little one while keeping your hands at a safe distance. Expect to see your veterinarian multiple times in the first year of your cat’s life. Routine veterinary visits are a vital for your cat, helping her to live a long, healthy life. Together, you and your veterinarian will become a united team creating and implementing your growing kitten’s wellness plan. In addition to being a new best friend, you will be the most important member of your cat’s health team. Enjoy all the milestones your kitten’s first year has to offer–the beginning of a happy, healthy lifetime together.